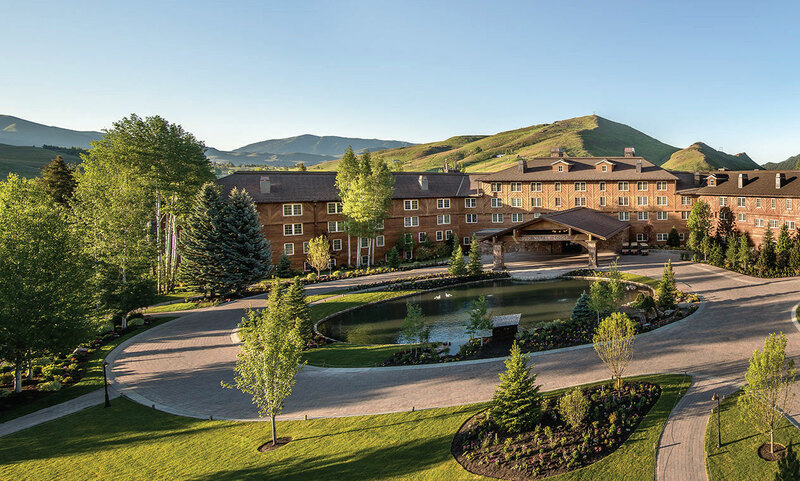 THIS SUMMER THE SUN VALLEY LODGE REOPENS FRESHER, REFINED, AND MORE EFFICIENT, YET STILL RADIANT IN ITS TRADITIONAL BEAUTY. 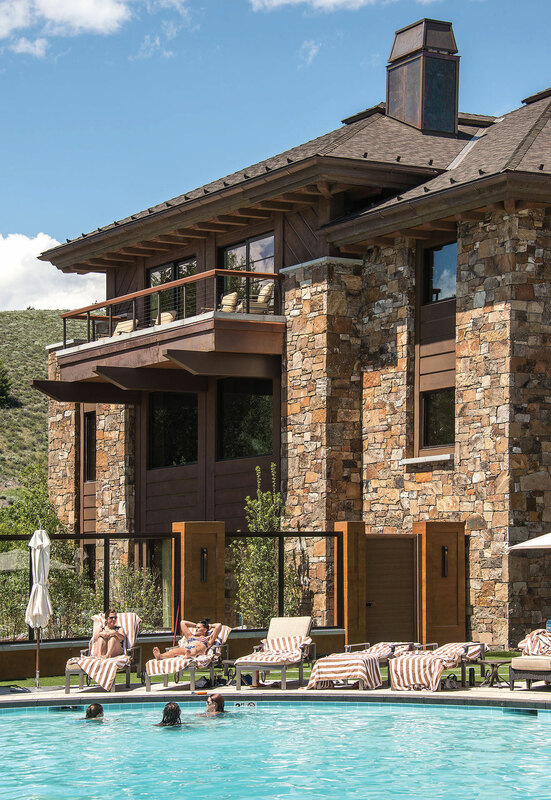 On June 15, the well-loved Sun Valley Lodge reopened as the historic heart of Sun Valley. It’s more than a renovation; it has been revitalized, rebuilt, restored, reimagined, reconstructed, refurbished, upgraded, refitted, modernized, and improved. Except for its charming stately historic beauty, it’s brand new. For the upcoming 80th winter season, the Sun Valley Lodge will be fully returned to its high standards for guest comfort and renowned hospitality, and it is additionally fitted with a dazzling new spa and fitness facility. It was a glamorous and adventurous year. In 1936, Britain’s King Edward VIII abdicated the throne in favor of romance, Joe DiMaggio first appeared in the major leagues, Pan-Am Clipper service commenced between San Francisco and Honolulu, Jesse Owens dominated track and field events in the Berlin Olympics, and Averell Harriman, Chief Executive of the Union Pacific Railroad, opened the Sun Valley Lodge amid glitter, glamor, socialites, and celebrities. Sun Valley became the first destination ski resort in the United States in 1936, and the amazing poured concrete lodge opened its doors an astonishing seven months after construction commenced for a reported price of 1.5 million dollars. The visionary behind the lodge was Gilbert Stanley Underwood, architect of many of the National Park lodges including the Ahwahnee Hotel in Yosemite and the Old Faithful Lodge in Yellowstone. In fact, it was the 1932 fire that destroyed another of his designs, the Lodge at the North Rim of the Grand Canyon, that inspired the unusual selection of fire-resistant stained and poured concrete for the Sun Valley Lodge instead of logs. The dismantling phase of the 2015 renovation of the Sun Valley Lodge took the building down to just these original 13-inch-thick poured concrete walls. When asked about his reaction to the new Lodge, Jack Sibbach, long-time spokesman for Sun Valley, comments, “It’s a rebirth. Everything about it is very exciting. It brings about a new positive energy.” And speaking of energy, there are energy savings that Sun Valley is looking forward to enjoying. 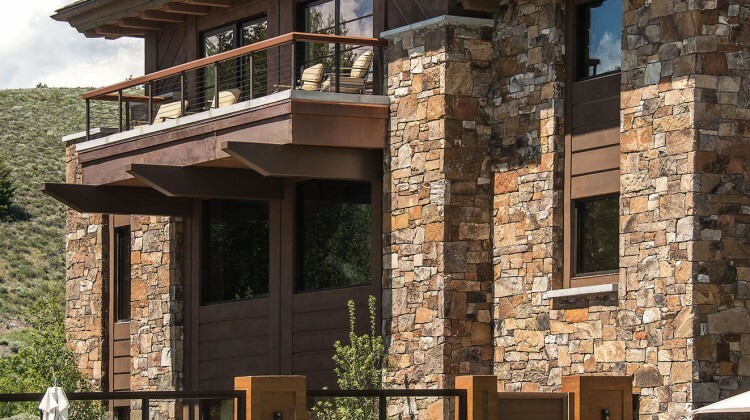 “In keeping with Sun Valley’s commitment to sustainability through efficient use of water and electricity, the new Lodge will use less energy than the former version of the building even with the 20,000-square-foot spa addition,” reports Sibbach. While most remodels add rooms, this will not be the case. The Lodge will have 54 fewer rooms than before. The new configuration features 94 larger, more spacious rooms. Of these, 65 will have fireplaces, and the luxury celebrity suites will have balconies. Much of the gained space is devoted to bathrooms; they will be four times larger than before in all the rooms. “The rooms are comparable to the finest hotels, anywhere,” observes Sibbach. The lobby will be lighter and brighter with more open space as a result of pushing the back wall out 16 feet toward the ice rink, but Jack Sibbach offers assurances that the views are still as great as ever. Just off the lobby are the Duchin Lounge and Gretchen’s Restaurant, new and improved but without the loss of their distinctive charm. The historic Sun Valley photos of notables, the famous, and stars that so many have enjoyed viewing over the years have been rehung. Downstairs, the game room with its bowling ally has doubled in space and allows for more equipement and another pool table, making it an even better place for birthday parties. The bowling alley has been revamped so the lanes meet standards, but none of the 1950s retro style was sacrificed. One of the iconic images of Sun Valley is the circular pool surrounded by lounging bathing beauties in one-piece suits a half-century ago. The pool, a favorite of guests, has reopened with the same size and round shape, but it is reconfigured to provide more patio space for poolside relaxation and extra space for socializing and events, a new hot tub, and a firepit. The new poolside café will provide refreshments and beverage service conveniently nearby. Perhaps the visitors 79 years ago enjoyed being pampered as much as people today, but there weren’t facilities back then. Now with the Lodge’s reopening, there is a supremely well appointed, equipped, and staffed facility opening, and it is dedicated to improving overall wellbeing. The new spa is by far the most substantial change to the Lodge. Two floors and 20,000 square feet are devoted to an unparalleled spa and fitness center. The intention is convenience for guests, as well as a new asset for members of the community to frequently come and enjoy. “Entering the new spa’s spacious soaring lobby, one can sense that it will be an unforgettable experience. 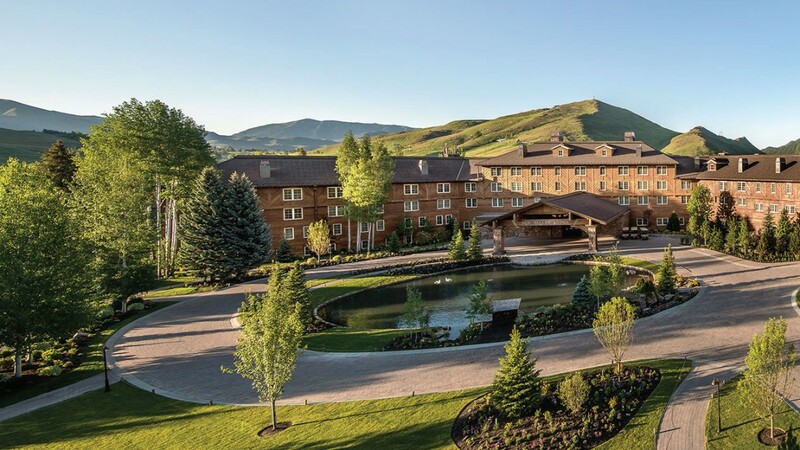 It is designed to reflect and complement Sun Valley’s unique and inspiring surroundings, and it is truly a five-star destination,” describes Tiffany Cameron, the spa’s new director, who brings expertise from managing numerous other resort spas and a background in massage therapy. 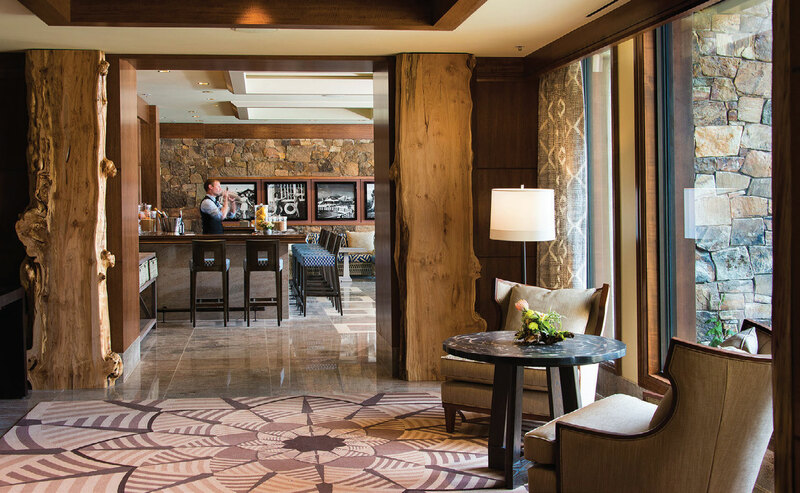 The lobby she describes is open to two levels and has two dramatic granite-faced sculptural fireplaces. Just off the lobby is a full-service salon. Also on the main floor are the well-equipped fitness center and the yoga studio. The luxurious men’s and women’s locker rooms are upstairs and off each are a steam and sauna for maximum privacy. The treatment rooms are upstairs and conveniently nearby. 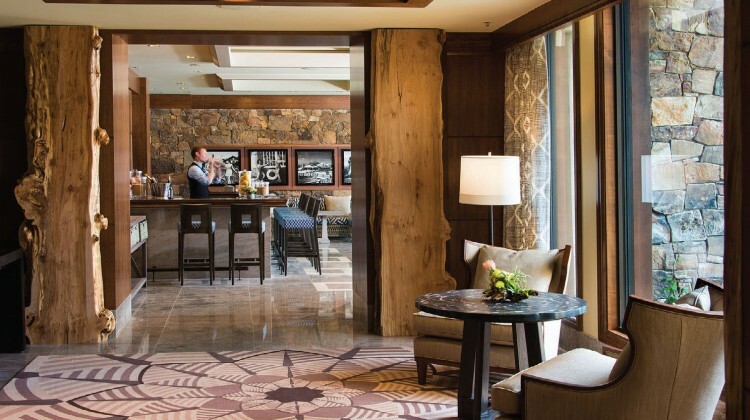 Sun Valley Resort staff will be offering tours of the newly recreated Lodge. Another way to experience it is to book a stay or a visit to the spa. There is always plenty to do; this summer offers another full slate of events and activities. Thanks to the efforts of hundreds of talented building professionals and the commitment of the owners, the Lodge is poised for 80 more years of hosting guests and creating memories. Who knows, maybe another great American novelist will check into the Hemingway Suite to pen a classic.